Made with lightweight aluminum alloy, the YI Selfie-stick weighs less than half a pound and is compact enough to carry in your purse or bag. It has a convenient 2-in-1 metal clip to hold your Bluetooth remote and doubles as a pocket clip. The YI Waterproof Case keeps your YI Action Camera safe while you go on an underwater adventure. No only does it protect against water, it protects against all harsh elements such as sand and scratches. A must-have for shooting underwater Take your YI Action Camera on an underwater adventure without losing it. The hand mount was used with materials that reduce the environmental impact in all aspects-from the way it was handcrafted to safety. A sleek and compact handlebar bike mount crafted with premium alumium and double-forged to ensure strength. The anti-corrosion protective coating and anodized allumium prevent rust and abrasion. Hands-free, first-person POV, and liberating single shoulder strap Handcrafted, environmentally friendly, breathable neoprene. High-quality 304 stainless steel used to prevent rust. Custom high-quality EVA foam to fit YI Action Camera, waterproof case, selfie stick, floating hand grip, and two thumb screws. The interior inner pocket is designed from premium mesh and zipper to store cables, microSD cards, and more. The YI lithium-ion battery makes for a great spare or replacement for YI Action Camera. Mount your action camera to your pet's back and capture images from their perspective. Lightweight, wearable and padded- it guarantees your pet is comfortable at all times. The YI thumb screw connects your YI Action Camera to other accessories such as the waterproof case and selfie-stick. The YI UV Lens protects your action camera lens against scratches, dust, fingerprints and more. 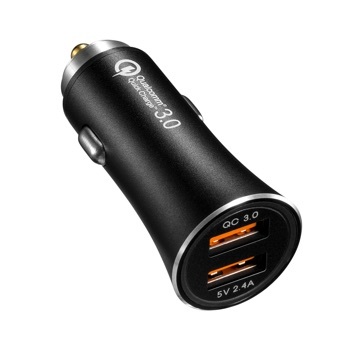 A dual-port USB car charger with quick charge 3.0 port to provide convenient and quick charging capabilities in your car. Compatible with all USB-powered devices including Android and Apple smartphones & tablets, YI Dash Cameras, YI Action Cameras, and more.